Imagine a cell phone you could roll up like a sheet of paper, or a computer screen flexible enough to wrap around a pillar. 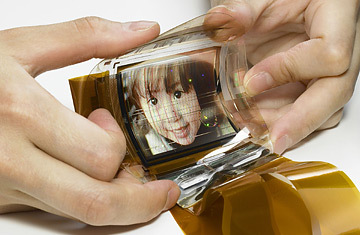 This spring LG.Philips and Sony demonstrated flexible displays that can do just that. Both ultra-thin screens use organic leds that display 16.7 million colors. Flexible screens have been shown before, but these mark a step up in durability and quality, and bring us closer to a future when the unyieldingly rigid gadgets we now covet will be obsolete.